Wilbur is our most expensive resident…and also my personal favorite (shh, do not tell the other pigs)! One of his medications alone costs $11 a day! I met Wilbur four years ago. A horse rescue needed help placing two pigs and we agreed to take them. When Wilbur arrived to Animal Place, he was 150 lbs overweight. It took months of exercise and a proper diet for Wilbur to lose the weight. His health improved, but we could not stop his aging. Wilbur started suffering from debilitating arthritis. Our animal care team consulted with veterinarians and crafted a treatment protocol for Wilbur, which includes a pain medication. As you likely know, sometimes the drugs prescribed come with side effects that also need to be treated. 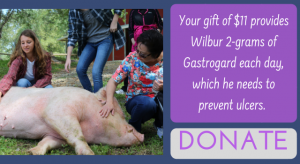 With Wilbur, a side effect of his pain medication is severe stomach ulcers that threaten his health. So in addition to his pain medication, Wilbur receives a drug called omeprazole (Gastrogard) to protect his stomach from ulcers. 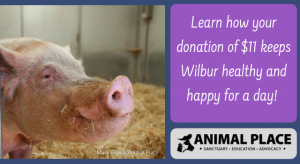 And your gift of $11 covers the cost of Wilbur’s treatment for one day! He is on a high dose – 2 grams a day! The omeprazole you buy from a pharmacy contains 20 mg tabs. That would translate to 100 tablets a day! And…Wilbur says no to that! Instead, he enjoys 2 grams of Gastrogard paste. Each tube lasts him 2.5 days and costs nearly $30. It’s tasty and Wilbur looks forward to his medication. You can help with a small gift of $11, which covers one day of treatment. Help us cover a year’s worth of Wilbur’s omeprazole and make 2019 the year of the pig . . . make that the year of Wilbur! PS: All it takes is $11 to keep Wilbur ulcer free for a day! Or $330 for one month!